Universal Cell Phone Strings: For USB Flash Drives, Flash Lights and Small Meters. Universal cell phone strings are cell phone style of connectors. They are designed and made as an add-on for a variety of applications. Universal cell phone string connectors come with split-rings (just a small version of key-ring on the top of connectors). They can be attached to key rings or small rings. The flexible and durable strings can be used to hook up cell phone, ID name badge holders, lanyards or retractable badge reels with all kind of small items, such as name badges, ID cards, bartender's bottle cap openers, USB flash drives, flash lights, small meters, perfume bottles, lipsticks, keys, displays and more. 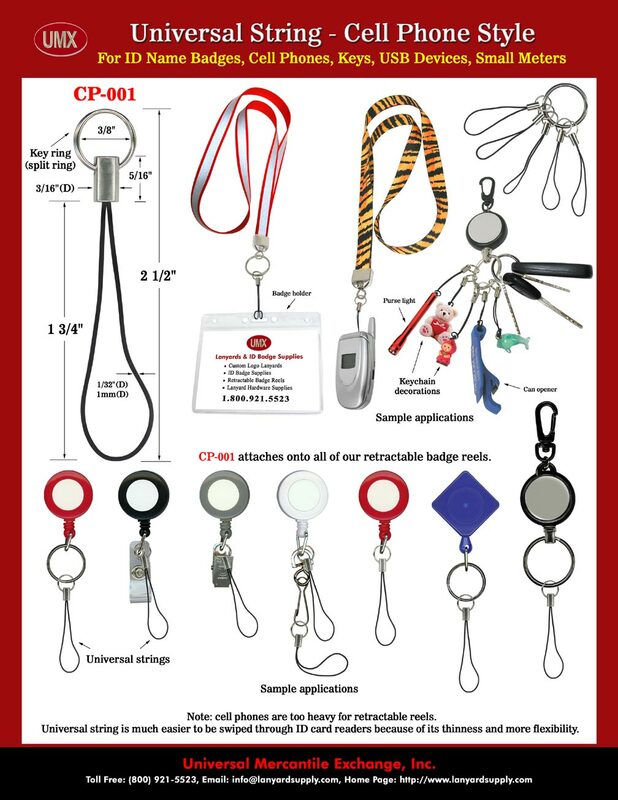 You are viewing Lanyards > Badge Reels > Universal Cell Phone String: For USB Flash Drive, Flash Light and Small Meter Supplies.